For the Grade Seven poetry unit, we decided to have some fun and use book titles sort of like a magnetic poetry set. I got the idea from Carol-Ann Hoyte, poetry maven and fellow library conspirator. 1. Each table gets a package of 80+ book titles in an envelope. 2. Each student makes their own poems using the book titles. More than one student can use a title. 2. They cannot add extra words or punctuation. 3.Once they have put together their poem, they write it down on a piece of paper or on their iPad and show it to the teacher. 4. Once they are finished they can come down to the library with their iPad to stack their poem with the actual books. 6. We make a virtual and/or physical display of the poems. A Reader’s choice is awarded to the best poem. Winner will get house points and a prize from the fabulous library prize box! So what did we use the iPad for? 2. The students used it to either write down their poems or take a photo of their bits of paper. Lesson learned- next time I do this project I will skip the step where I email the photos to mysellf and simply pin them directly from my iPad! Still you can view the Book Title Poem Project Pinterest Board nicely with the Pinterest app- in fact I like the view better on the iPad than on my desktop- it seems coiner somehow! I would take better pictures. With a nicer background. The photos above leave quite a bit to be desired. I would also stagger the times the students can come and stack their books- there was a little book stacking chaos going on! I have been thinking about the comment Lisa Johnson made on my blog yesterday, where she asked me what my tips would be for parents. I realized then that, in keeping with our school’s philosophy of guiding our students on their journey toward Digital Citizenship, I would rather give tips to the students first. It is important that they realise they are responsible for their own behaviour. If they find themselves getting distracted by the iPad, then they need to figure out a solution that works for them. Although we can support them by giving suggestions, enforcing rules, etc. Ultimately it is up to them. Now, that doesn’t mean I don’t think the parents have a place in this guiding- they most definitely do. But each parent knows their kid- knows how much responsibility they are ready for, knows their strengths and weaknesses. For example, my daughter does not have a problem with getting distracted by the iPad. When she is doing her homework she is focused and alert. (I feel very very lucky and in no way am trying to say this has something to do with me. It is all her). But I know for a fact that other people’s kids might need more structure. perhaps in their case, guided access might be necessary and they will appreciate the intervention. So I guess my only tips for parents is to know your kid and act accordingly. We have all felt it. The rapid pitter patter of our heart as we gently press the home button. The swoon as Siri tells us what time it is or how to solve a complex trigonometry question. It is love. And love is good, really. But warning: love can turn ugly very quickly. One moment you are gazing dreamily at the home screen with all your apps lovingly tucked away in folders. The next it’s three o’clock in the morning and your finger is sore from tapping furiously on your angry birds game and you have to get up at seven for school and still haven’t studied for your science exam. Love has turned to obsession and obsession is a dark land of sleepless nights, depression, obesity and loneliness. Here are a few tips to help you keep your relationship with your iPad happy, healthy and enduring. Speaking from experience, getting enough sleep is important to a healthy relationship. I know, I know. You are in the honeymoon phase. You can’t tear your eyes away from each other. You don’t want to say goodnight. But the next day you can’t wake up on time. You are late for school. You fall asleep in class and it happens to be the day where the teacher tells you exactly what is going to be on the test. You still want to be with your iPad, but everything it does annoys. It freezes when you need it. The keyboard is too small. And before you know it you are screaming hurtful things at Siri. Luckily, there are ways to avoid such disasters. 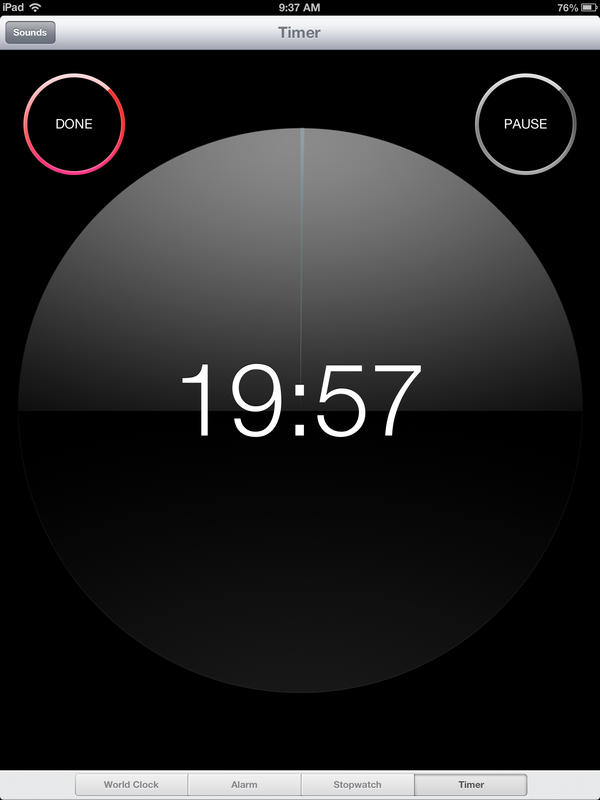 Set a “curfew” for yourself and your iPad and say goodnight (shut it off) at the appointed time. This should ideally be aboutan hour before you go to bed as screen time before bed is proven to disrupt the quality of your sleep. If you find it too hard to have it in the room, get your parents to help. In my house we have a corner of the kitchen counter reserved for tech. It is the place where we charge our phones and iPads overnight. Just like sleep, healthy eating and especially exercise are very important to a healthy relationship. 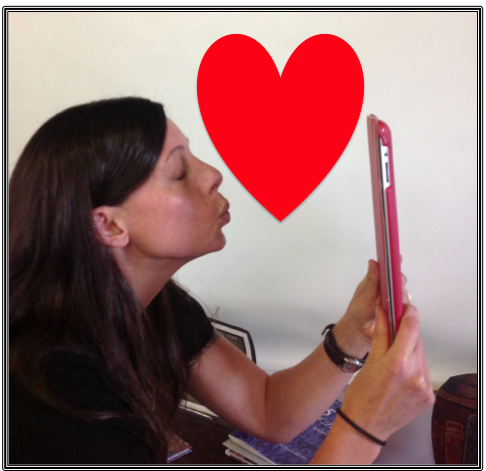 And no, it is not all about looking good for your love (the iPad loves you just the way you are). Although the iPad is a lovely companion, it can be very lazy. If you have no choice to remain for a long time on the iPad (for example studying for an exam, writing an essay or completing a multimedia project- no, Angry birds doesn’t count)make sure that you get up and stretch every half hour. You can even set the timer that comes with the ios6. It will run while you are on other apps. When it beeps, get up and move! If you really can’t tear yourself away from the iPad, use it to help you keep fit. There are many free apps where you can record your exercise. It is also a great tool for watching fitness videos. But the best thing to do is turn it off and go walk the dog, or go for a run, or play a game of soccer/basketball/street hockey- whatever floats your boat! Heck, you can even go float in an actual boat if that option is available to you. The ipad will be there when you get back. Promise. A relationship is more likely to succeed if you continue to do the things that make you you. If you wake up one day and realise you haven’t been to the gym or you haven’t talked to your friends for days or joined your siblings in a marathon game of Monopoly then you have let your relationship with your iPad take over your life. You are no longer you just the person hanging on to the iPad. If you remain true to yourself I guarantee your relationship with your iPad will be the richer. You won’t start taking it for granted. Your relationship will still have meaning. Constant vigilance! Set yourself limits. Make sure you take some time away from the screen. Set yourself daily challenges: I will actually talk to my parents at the dinner table tonight instead of shoveling my food in my mouth as fast as I can so I can get back to my iPad. 4. Friends and Community are important! No relationship exists in a void. The iPad won’t be able to give you everything- it won’t be able to give you advice, (I would caution you to not take Siri’s advice. She doesn’t really know you) or listen to you rant about your parents. Close your device when hanging out with friends. Give them your full attention-they deserve it! Don’t sacrifice your social time for iPad gazing. Make an effort to go out with your friends, to participate in your community. Make an effort to do activities with friends that doesn’t involve technology. Talk to each other face to face (no, I didn’t mean facetime to facetime). Go shopping or swimming or play a boardgame. Switch it up, for the love of pete! 5. A relationship should support you not hinder you. Don’t let it distract you! Use the Do Not Disturb setting on your iPad! Go to settings–>Notifications–>Do Not Disturb. 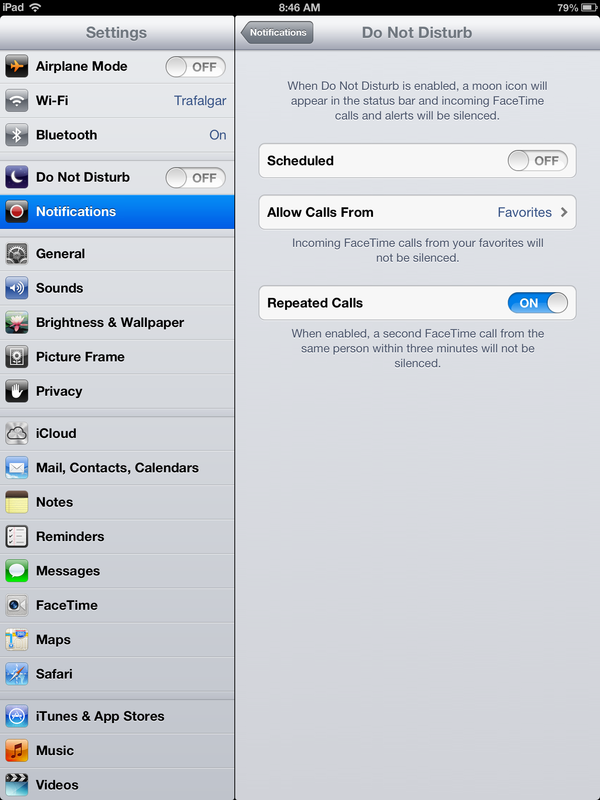 This will not allow any facetime calls or app notifications (eg. my scrabble app notifies me when the person I am playing with has finished their turn) for the period you set. Turn notifications off for your apps. You post a time that you are starting a “pomodoro” a 25 minute period of consistent work and ask if anybody is in. Depending on how big your network is, someone might join you. As soon as you posted your pomodoro you do 25 minutes of work. Then you get up and stretch your legs. I know, I know. It sounds kind of silly. I was skeptical too. But then I actually tried it and couldn’t believe how just posting the fact that I was going to do 25 minutes of work made me actually want to live up to it. Give it a try- put the “work” back in social network! Lisa Johnson does it again and writes about an issue that has been concerning me for a while now. It is like the woman is talking directly to us, don’t you think? This is just a screenshot- you can download the original from the original post. I cover many of these solutions with the children, but haven’t had a chance to talk to the parents yet. Restrictions: restrict access to age-appropriate content and apps (NB has great info on their student device restrictions’ settings). Numbers 4 and 5 make me a tad nervous however, though I understand kids are all very different and need different boundaries. But the idea of restricting the iPad to one app seems extreme to me. As for restrictions, I am not sure how much that is needed in a high school setting as opposed to an elementary school. My feeling is that we want to teach mindful use to technology, which includes knowing when to turn it off as well as accepting personal responsibility for their own behaviour (hmmm. a lot like like teaching them how to be a citizen, let alone a digital citizen). I like how they added turning off notifications and managing distractions. And I had never really looked at the “Do Not Disturb” setting, which I like because that means the student can help themselves in their quest against distraction. I also like how they begin with vigilance. I maintain that Digital Citizenship requires the proverbial village to teach- a joint effort between teachers, parents and peers. Though Dan is working on a simple way to share a file this size with the students without having to go through itunes, it still is a problem for our intrepid science team who are making amazing iBooks. Hopefully this problem will be solved soon and the students can begin using their iPads in one of the ways it was originally touted- as a portable, interactive, multimedia textbook. Are Borders Appearing on Your Icons? Got to work this morning and one of the iPads from the iPad lab was on my desk with a note saying that it wasn’t working properly. Frames would appear on the selected icon and the iPad did not respond very well to any taps or swipes. So I did what I always do when faced with the unknown: I googled it. Oh Apple Support Community, how I love you. Note- this is not a problem with the iPad 3 apparently- I tried to activate voice over by pressing the home button three times but nothing happened. Awesome infographic: Can I use this image on my website? Okay, so this is not specifically about the iPad but we all do it: we need a visual for a story or a presentation. We type in the subject in google images and take which ever one strikes our fancy. We don’t care where it comes from. We don’t link to the original source or make an effort to give credit to the photographer. We just need it, yo. By Pia Bijkerk, Erin Loechner and Yvette van Boven. See how I cited my image? I learn, I learn oh how I learn. For databases of images in the public domain, check out my pathfinder. 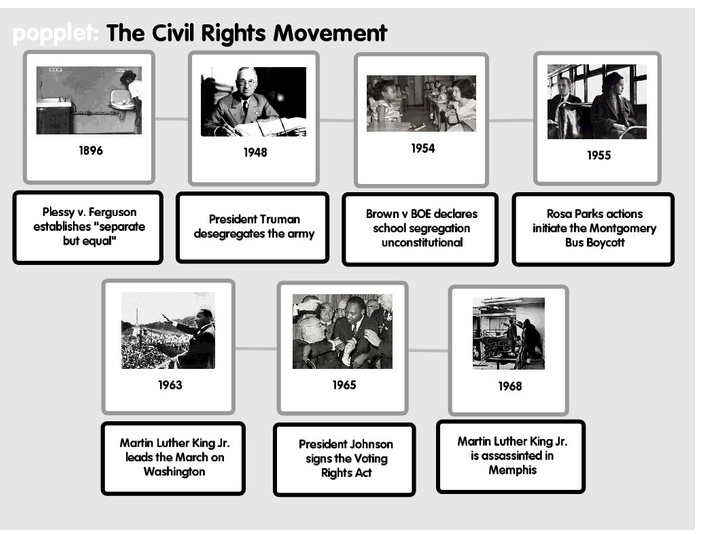 The relevant part is that they have to create a timeline to stick in their iMovie. I didn’t want to chain the students to one particular app as most of them are using their own iPads and they might not have the particular app. And in fact, I think that might be a rule of thumb to remember in the future: it is the task that matters, the content. What they use to accomplish it is less relevant. (Unless it is a class about the tools, for example a multimedia class). Note the red. Yes, that means you have different colour options to draw with! You can also change the colour of the frames as well as the overall background colour, although I noticed that some of the options for colour didn’t work. I am not sure if that is just a glitch or if it is because I was using the lite version. 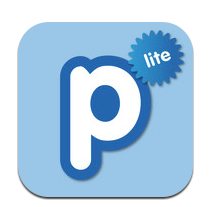 Oh- and you can also change the title, by tapping on “my poppet” and changing the text. 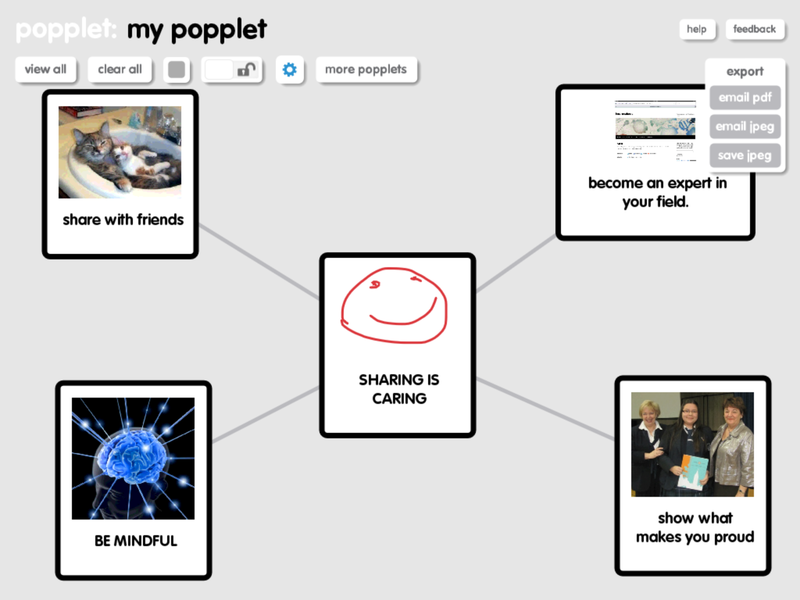 The Popplet lite version only allows you to do one Popplet at a time, but if you export the one you are doing before starting another it shouldn’t matter too much. 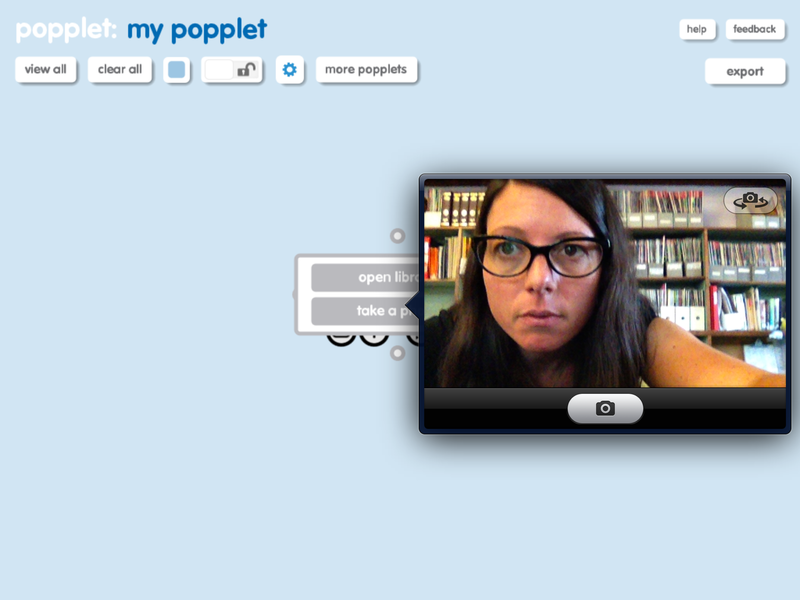 As soon as I have the time I will be adding Popplet to the iPad lab!